Aloha! This one-bed, one-bath cottage is located just 100 steps from the beautiful, tropical, blue, ocean beach. If you are a diver or just enjoy snorkeling, this cottage will surely meet your needs being only one block from Sharks Cove which provides the best diving and snorkeling anywhere on the island. 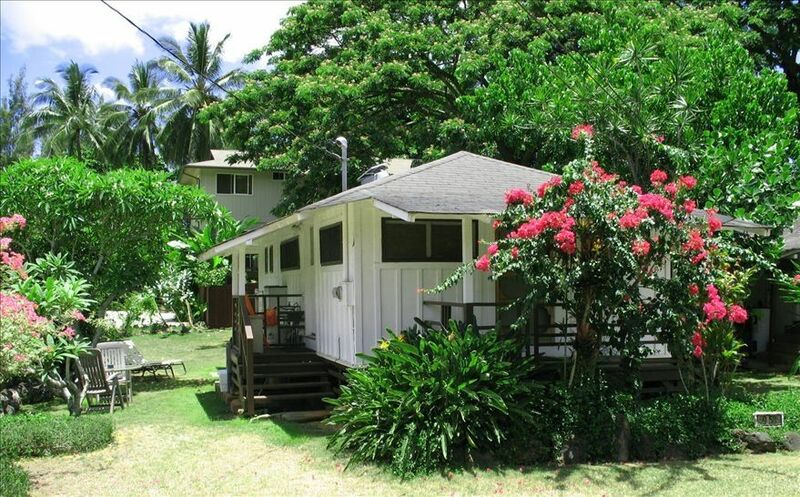 This cute cottage is set in a lush, tropical environment lined with fragrant, plumeria trees. It is located one minute from Foodland and The Coffee Bean for convenient shopping & gourmet coffee. Walk out the door to the bike path for morning strolls or bike ride on a tropically-landscaped, garden path. You will not be disappointed in this cottage featuring a new kitchen & bathroom. It is hard to beat this location which is encompassed with the world's best surf, snorkeling, diving, and beautiful beaches. Waimea Bay, Bonzi Pipeline, Haleiwa, and Sunset Beach, all within minutes away.